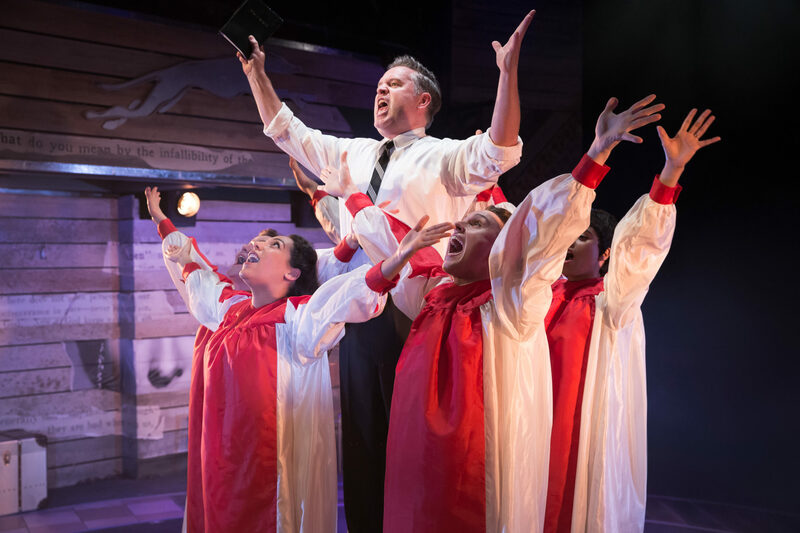 Down the road from where Violet is playing there’s another musical tied to the American civil rights movement. It’s called Caroline, or Change, and it’s a triumph. Its soaring, hopeful score by Jeanine Tesori, who also penned the score for Violet, pretty much nails the characterisation all on its own, and that’s before Sharon D. Clarke flaws with her acting. Violet deals with some the same themes – discrimination, identity, and self-fulfillment – although it never quite nails them like Tesori’s other show a short walk away. The eponymous Violet is a bravely written character though, which assures this show sustains interest even if it never simmers. Kaisa Hammarlund confidently manages both her likable and unlikeable qualities; she’s driven and compassionate, yet naive and curt, neatly avoiding the cliches of wafer-thin or underwritten female musical leads. 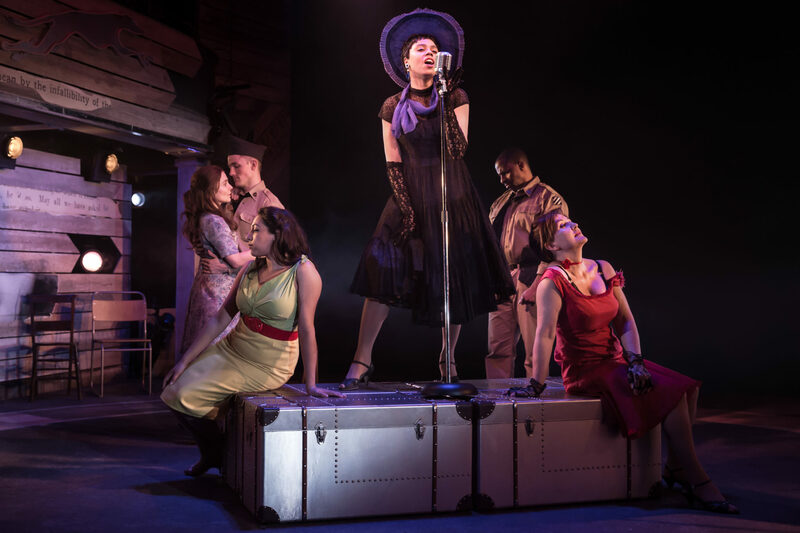 Violet’s story revolves around (literally, on a high-tech circular moving stage) a Greyhound bus journey across the southern states of America. Our young lead jets off in search of wisdom and truth, and to extinguish her own anxieties about life and love. There are a couple of mesmerising scenes, namely anything featuring Kenneth Avery Clark’s boisterous, charismatic preacher, and the arresting motown, rock and blues solos from Angelica Allen, Jay Marsh and Simbi Akande, which outshine Violet’s own spotlight musical moments. But the excitement these momentary scenes induce can’t outweigh the plodding pace of the narrative elsewhere. Sometimes Violet is slow like an actual Greyhound coach journey. And like an actual coach journey (sorry I’ll stop) it can reveal intriguing sights, only to then feel predictable. At two hours straight through the show also boasts a similar ‘no stopping for toilet breaks’ policy. 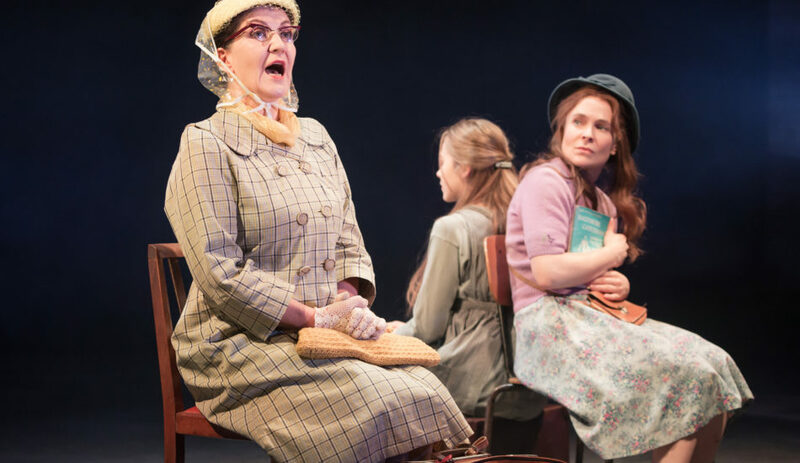 Violet has her heart in the right place, and by its close, her show manages to drive home a pretty convincing emotional tale of life growing up as an outsider, but if there’s one musical written by Jeanine Tesori to see this winter, it’s her five-star show, Caroline, or Change.